The city is set to pay up after trashing and crushing the personal belongings of three homeless New Yorkers as they looked on helplessly. Just over a year after the three men had their medications and birth certificates thrown into a trash truck and crushed by police and sanitation workers, they will be compensated, the New York Civil Liberties Union (NYCLU) said. Floyd Parks, Timmy Hall and Jesus Morales were sleeping near the entrance of a school building in East Harlem on a rainy Friday in October 2015 when the incident happened, NYCLU said. It was about 5 a.m. when they were woken by police with flashlights and sanitation workers in hazmat suits. The men were told to move along, so they started to gather their belongings. But before they could do so, the officers and sanitation workers grabbed their things and chucked them in the trash truck, where they were crushed. 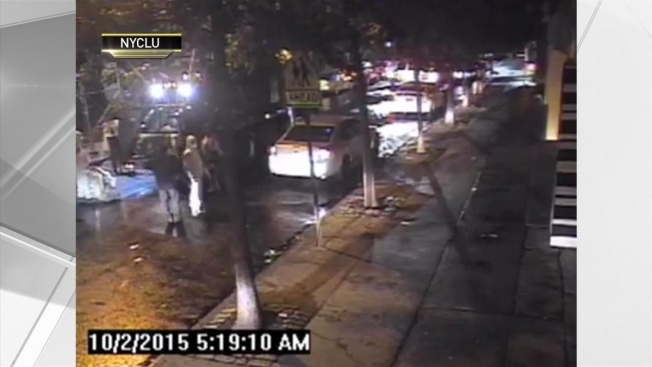 The incident was captured on surveillance camera, which NYCLU obtained through a Freedom of Information request. It shows Parks, who has been homeless since 2013, pleading with the sanitation workers to let him get his belongings. His blood pressure medicine, inhaler, birth certificate, ID card, social security card, a list of contacts and shelters and his clothing were all thrown in to the garbage truck, NYCLU said. “I'm grateful that the city is paying me back for the things the cops stole from me because I'm homeless, I need new shoes and a warm jacket, and my disability benefits aren't enough,” Parks said. “With this settlement, we got our foot in the door. People will know how we've been treated and that the cops should stop kicking around and abusing homeless people." Morales lost his birth certificate, social security card, clothing and personal hygiene products, while Hall lost his birth certificate and social security card, and various items of clothing. NYCLU said the men would be compensated for the exact amounts they had asked for in their notices of claim to the city: $800 for Hall, $500 for Parks and $215 for Morales. “Homeless people deserve to be treated with dignity like all New Yorkers, and the city acknowledged that it had no right to treat their few possessions like garbage,” NYCLU executive director Donna Lieberman said. New York City did not immediately respond to a request for comment.